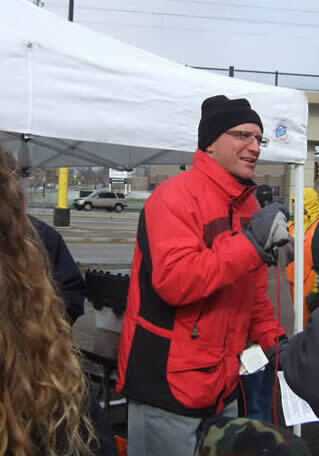 The MCW’s 8th Annual Arbor Day tree planting event was designed to test the grit of even the heartiest tree lover. 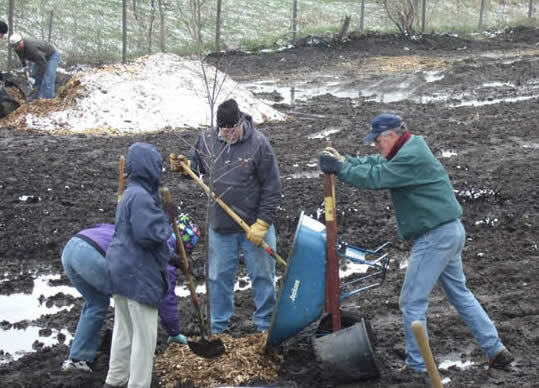 Over 150 volunteers rose to the occasion, and together they braved frigid temps, the occasional snowflake and a large sea of mud to plant nearly 250 trees and shrubs at the site just east of Hiawatha near the new Sabo Bridge. The mood of the crowd could not have been more cheerful or enthusiastic, and thanks to excellent organization and hard work by Tree Trust and many others, the planting was finished in record time. As before, the planting design featured the beauty and environmental benefits of native plants. Created by landscape architect Gina Bonsignore and refined during community meetings held over the winter, the design includes a central "roundhouse" grove and spur lines of trees that frame green spaces and line the pathways, echoing historical rail uses. Like past Arbor Day events on the Greenway, the planting was made possible thanks to a longstanding, successful partnership between the public sector, community organizations, and corporate partners. Hennepin County provided key technical support and funding, with additional financial support coming from Allina Health Systems, Wells Fargo, Target, and Xcel Energy. This year MnDOT, which owns the site, contributed financial support through its Community Roadside Landscaping Partnership program. Every Arbor Day has contributed to the Greenway's growing into its name, but it is especially exciting to see the beginning of this site’s transformation from former industrial railyard to welcoming, urban greenspace. Commissioner Peter McLaughlin joins a volunteer crew. MCW Chair David Orbuch addresses the crowd under gray skies.